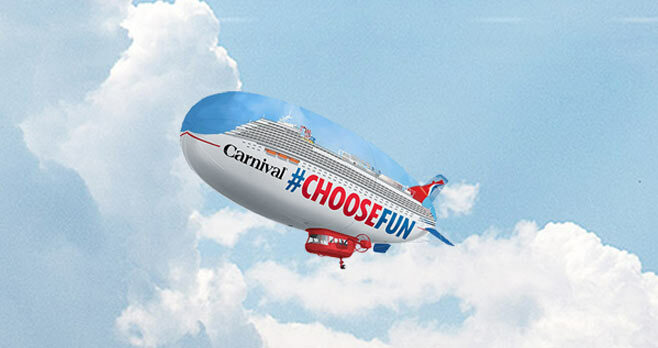 You are invited to visit www.carnival.com/ChooseFun and enter the Carnival Cruise Line Choose Fun Sweepstakes for your chance to win a cruise for two with Carnival Cruise Line. Spot the airship to get started. Eligibility: The Carnival Cruise Line Choose Fun Sweepstakes is open to legal residents of the 50 United States, or Washington, D.C. (excluding residents of Puerto Rico, the U.S. Virgin Islands and other U.S. territories and possessions, and where prohibited by law), who are 21 years of age or older at the time of entry, and have a valid email address. Promotion Period: The Sweepstakes begins on August 29, 2018 at 9:00:00 AM ET and ends September 30, 2018 at 11:59:59 PM ET. Limit: There is a maximum of one (1) Entry per person/email address during the Sweepstakes Period. Prize(s): The grand prize consists of a cruise with Carnival Cruise Line for Winner and one guest.